Rugged professional grade multimeter offers a complete set of ranges for every service application, including frequency and temperature. Optical RS-232 interface allows datalogging with a PC, while safely keeping components isolated. Rugged molded housing includes a specially designed holster to stand up to the daily rigors of field service use. Large backlit LCD display is easily read from several feet away. 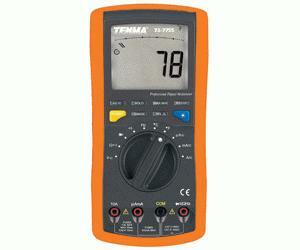 Measures AC/DC voltage, AC/DC current, resistance, capacitance, temperature, RPM and frequency. 3 3/4 digit, 3999 count backlit display features 7/8" digits and numerous on-screen icons, for easy at-a-glance reading.